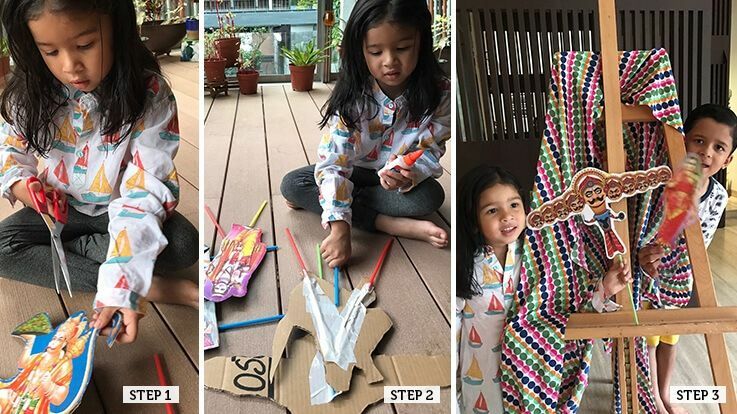 Parenting >> blog >> Hobbies >> Parentune DIY: Kiki turns her favourite cartoons into puppets! My children love to read books. Their favourite books are read and re-read several times over to the extent that they now remember them verbatim. So no wonder that when it’s time to say goodbye, the parting is always full of teary eyes! My children have a bunk-bed, so we often hang scarves or sheets to create our own little puppet theatre for a mini family performance. Do you have any other DIY ideas? Please do share them with us in the comments section below, as we would love to hear from you. I never liked books as a child and regret not reading enough so I guess that was my motivation to steer my children towards books. We started with simple things like- they choose the books they want to read (not always my choice), reading them a story during bed time (sacrosanct), borrowing books from the library- we have a library membership and they love the process of borrowing books. I started with not forcing them to read books instead I read to them and just let them spend sometime with the books- holding, flipping pages and even scribbling. Over a period of time their love for books grew. How you made sure that your kids love books? My child is least interested in studies .Hardly he..
My kids are always unwilling to do as they r asked..